A man is known by the company he keeps and probably the gifts he presents. So, if you really have to impress some one with your choice of gifts, sterling silver Italian horn charms might do the trick. Check out our information guide! Italian horns have for long been in use as protectors and good luck bringers. They have a reputation for warding away evils. What better way to have the protection of an Italian horn and that too in the traditional way; by wearing a sterling silver Italian horn!!! 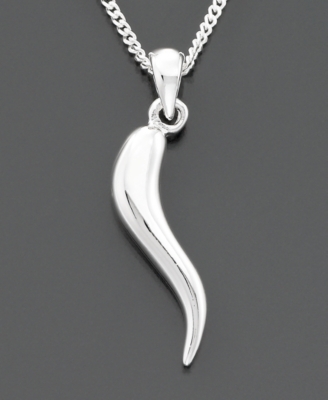 For a long time, Italian horns are known to protect against the evil eye superstition. The evil eye was supposed to harm fertility, sexual powers, harvests and nursing women, all because of jealousy. In order to guard themselves against this jealousy, people used to wear the horns of the moon goddess, who was considered to be sacred in Italy and pre Christian Europe. Traditionally the horns were made in silver as silver was closely associated with the moon goddess and hence was considered sacred as well. Even after the arrival of Christianity in Italy and Europe, the use of horns as protection and good luck charms continued, although the moon goddess was replaced by the images of the Virgin Mary, who was often shown by standing on the lunar crescent. Silver was the first choice traditionally. Although the horns are made in a variety of materials these days including yellow gold, white gold, platinum and diamonds, not to forget the natural corals, yet the importance of the sterling silver Italian horns cannot be denied. Silver is a precious metal which cannot be used in its pure form as it is too soft. It has to be combined chemically with other metals to produce an alloy which is both precious and durable and is commonly known as sterling silver. Mostly, copper is combined with silver; however, zinc, germanium and platinum along with boron and silicon can be added as well. The sterling silver usually contains 92.5% of silver along with 7.5% of another metal. For many centuries, Italy has been producing remarkable and exquisite silver jewelry. Italian silver has a lot of varied influences; Egyptians, Arabs and Greek influences, which have made it even more rich and tasteful. The Italian master silversmiths have perfected the art of fine silver jewelry making over the years using traditional as well as contemporary techniques, which have made them second to none. More and more Italian jewelry designers are turning to the first love of their country and are producing breathtakingly beautiful creations. Italian silver horns have become the latest fashion craze. Available in various sizes, they are very pretty to wear and go with every style of clothing. They can be worn individually or can be worn in layers with other charms. Many people like to wear them along Crosses for better protection. Their prices vary according to their sizes, but on average you can find a decently sized silver Italian horn for around $30. So, what are you waiting for?